Note: If you would like to read more articles like this one, check out my earlier analysis of the baseball scenes in “Speedy”, as well as Larry Granillo’s excellent forensic investigation into Ferris Buehler’s whereabouts on his day off. Cheers is widely regarded as one of the best sitcoms of all time, but for a baseball fan, the classic show is even more special. With its main character being a former relief pitcher for the Boston Red Sox, baseball was integrated into the plot of countless episodes. In fact, it took the sitcom only three airings before it built an entire story around the Yankees/Red Sox rivalry. In the Tortelli Tort, which aired on October 14, 1982, Carla, the bar’s acerbic waitress, assaults Big Eddie, an obnoxious Yankee fan (only Hollywood could dream up such a character) who is unmercifully taunting the patrons at Cheers immediately after their favorite team suffered another loss to the hated Bronx Bombers. However, the point of this exercise deals with what takes place before that confrontation. In an earlier scene, Carla is nervously watching the Red Sox attempt a ninth inning comeback against the Yankees. Even though there are two outs and Boston is trailing 5-0, she is nevertheless drawn into the game, only to have her hopes dashed when Carl Yastrzemski pops up to kill the rally. In a scene that probably played out repeatedly in bars across New England before the Red Sox finally won the World Series in 2004, Carla publicly disavows here loyalty to the team, only to return to her better, and more basic, instincts when Big Eddie shows up. Although we know what drove Carla to attack Eddie, the actual game that stirred her emotions remains a mystery…until now. According to the announcer, whose voice is heard in the background, the Red Sox are trailing 5-0 in the bottom of the ninth. Normally, that would be an excellent clue, but there’s no guarantee that information represents a real game situation. In fact, the voice over doesn’t seem authentic. So, we are left with only three quick glimpses of actual game footage from which to draw our inferences. In the first look at the game, three players are identifiable. Standing at second base, presumably after a double, is number 51 on the Red Sox. Luckily, we get a full look at the runner and can unquestionably determine that he is Reid Nichols. The pitcher is also identifiable. Although the view is a little blurry, and only the first number 2 can be seen on the left hander’s back, the profile and delivery of the pitcher in question unmistakably belongs to Tommy John. Besides, the only the lefty on the team with a number in the 20s was Shane Rawley, who does not resemble the pitcher on the screen. John faced Nichols on 21 occasions (the outfielder had 10 hits in those confrontations), but their first matchup didn’t take place until 1982. Considering the episode aired on October 14 of that year, we can now conclude that the game footage was taken from that season. This discovery allows us to also indentify the third player, a diminutive left hander batter wearing the number 2, in the second clip as Jerry Remy. Luckily, John only made one appearance for the Yankees at Fenway Park in 1982. On June 9, the left hander pitched seven innings against the Red Sox. And, sure enough, one of the seven hits he surrendered was a double to Nichols. To add further confirmation, Remy was the next batter in the game. However, those events took place in the third inning, not the ninth as suggested in the plot. As a result, we can definitively state although the outcome of the game is fictional, the action shown on the Cheers’ TV is real and took place on June 9. Case closed! Well, not quite. In the third clip aired on the show, the episode throws us a curveball. Instead of John being on the mound, there is a new pitcher in the game. How can that be? After all, the action in the fictional game Carla is watching is supposed to be contiguous. We can probably chalk this inconsistency up to poetic license. Although it’s possible the director simply blundered, it seems more likely that the plot was gerrymandered to include Yastrzemski, who was among the most recognizable players in baseball at the time. The use of a non-contiguous second clip means our forensic investigation isn’t over yet. The batter is easily identifiable as Yastrzemski, and with a little more detective work, we can also definitively conclude that the pitcher, whose number 43 appears prominently, is George Frazier. At first glance, this seems like more corroboration for the June 9 date because the tall right hander did pitch in relief that day. However, he did not face Yastrzemski. Big Eddie is a Yankee fan out of central casting. Like any good mystery, we now have a second smoking gun. Luckily, this one also leaves behind an identifiable trail. It wasn’t until 1982 when Frazier first faced Yastrzemski, so we can again narrow down the clip to that season. The first match-up took place on June 8, one day before the action depicted in the second clip occurred. In the episode, Yastrzemski breaks Carla’s heart by popping out, but in the real game, the future Hall of Famer singled against Frazier, helping to set up a game winning rally in the bottom of the 10th. Despite the disconnect between fact and fiction, we can again attribute the inconsistency to poetic license, allowing June 8 to remain a candidate. Complicating the issue is Yastrzemski and Frazier faced each other again on September 24. With the players and umpire in the clip shown wearing long sleeves, the early Fall seems to be a more likely setting than the summer, but one last clue dispels that doubt. Before Frazier delivers the pitch, the number 21 is visible on right sleeve of a rather large home plate umpire. 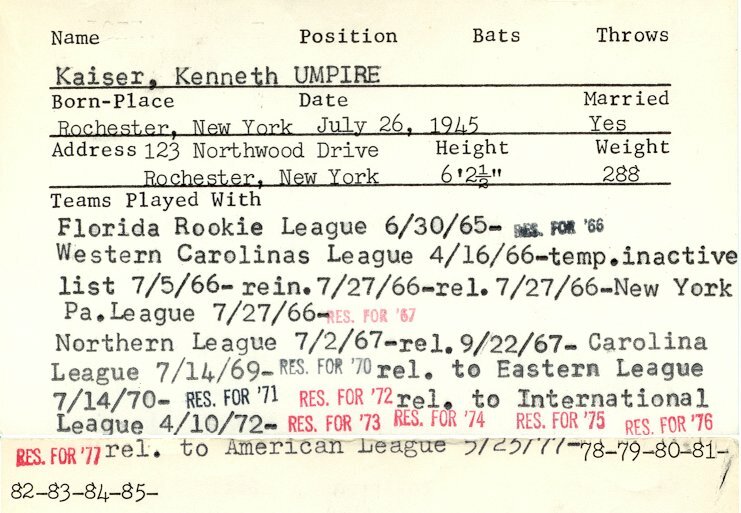 According to the box score, Ken Kaiser was calling balls and strikes on June 8, and he fits the bill on both counts (see here and here for proof). With that final piece of the puzzle in place, we can now declare the mystery solved. It is amusing to note that Boston won both games used to depict the angst that had become synonymous with rooting for the Red Sox. In a case of art imitating life, the episodes’ writers perfectly captured the ability of Red Sox nation to see the negative, even in victory. Another example of fantasy taking a page from reality occurs when Big Eddie boasts about the Yankees’ 23 World Championships since 1918. However, in 1982, the Yankees had “only” won 22. Was this an error by the script writers? Or, was it a clever, albeit subtle dig at the arrogance of Yankee fans? That’s a question I can’t answer.